I shared the trip with a merry band of photographers as part of a super workshop with Colby Brown. I will give the thumbs up for any trip Colby leads. Due to Colby's intimate knowledge of the country, and its ever-changing weather patterns, we were consistently on top of some of the best light I have ever witnessed. Towards the back half of the trip we found ourselves at one of the most iconic of locations in Iceland - Kirkjufell. As we arrived for a sunset shoot the overhead clouds promised the potential for one of those epic evenings. And it certainly went off like a fireworks show as the clouds spread out over the mountain and began to take on an intense palette of of colors. We were spread about the various banks along the waterfall and on occasion I kept looking back behind me to check on the light. And that is when I noticed my pal Peyton Hale had slipped into a point position to grab a shot. I quickly turned the camera and asked Peyton to keep still for 4 seconds. A tall order perhaps but he nailed it and I grabbed this one shot that makes me smile. To be in such light, in such a location, with a group of friends is all that matters. That and a really good Icelandic beer! And if you are interested in what we were photographing just check out the image below. 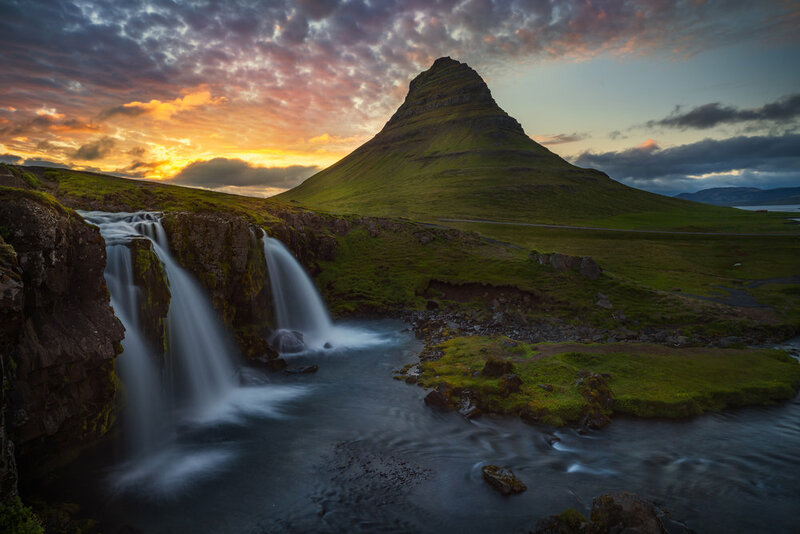 This is Kirkjufell in all its glory. Note: for the best viewing experience, Click on each image to view it in LightBox Mode.